This blog and associated media are an almanac of personal observation around the #Vedic #Age of #Dwapara #Yuga and #Yoga. Any profits are donated to the One Laptop Per Child Charity #OLPC. "I wonder if Western scientists, patiently enlarging the realms of knowledge for the practical good of mankind, are not more pleasing to God than idlers who profess religion but concentrate on alms" - Swami Sri Yukteswar. Perhaps you will agree, that the world is facing a crisis. What is the cause of it, and what is the remedy? All nations have to follow the influence of the ascending and descending yugas. The present world crisis is due to the upward climb of Dwapara Yuga; in order for the world to become better, evil must be expunged. The forces of evil will cause their own destruction, thus assuring the survival of the righteous nations. The conflict between good and evil has been going on since the dawn of history. But as the world is moving upward through the Dwapara Yuga, the electrical or atomic age,there is greater potential not only for good, but also for destruction through the misuse of technology by those who are greedy and desire power. In keeping with the influence of Dwapara Yuga, technology is rapidly moving the general populace to higher levels of achievement. But the progress also creates a greater gap between the achievers and the nonachievers. This foments jealousies and social, economic and political troubles. Would you like to give a message to the world? My brothers and sisters of the world: Please remember that God is our Father and he is One. We are all His children, and as such we should adopt constructive means to help each other become physically, mentally, financially and spiritually ideal citizens of the United States of the World. If in a community of 1000 persons each individual tries by graft, fighting and chicanery to enrich himself at the expense of others, each person will have 999 enemies; whereas if each person cooperates with the others - physically, mentally, financially and spiritually - each one will have 999 friends. If all nations helped one another through love, the whole world would live in peace with ample opportunity for promoting the well-being of all. When every soul will rise above petty divisions in true spiritual understanding, world misery will be consumed by the fire of realization of the universality of God and the brotherhood of man. Such media as radio and television and air travel have brought us all together as never before. We must learn that it can no longer be Asia for Asiatics, Europe for Europeans and America for Americans, and so on, but a United States of the World under God, in which every human being can be an ideal citizen of the globe with every opportunity for fulfillment in body, mind and soul. That would be my message, my plea, to the world. These excerpts are from a 1951 (251 Dwapara) interview with Paramhansa Yogananda, reported in Journey to Self-Realization, published by SRF. 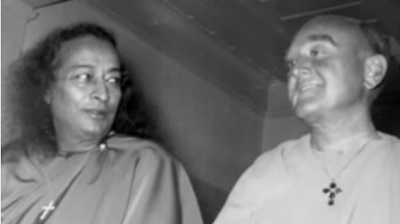 Yogananda is pictured with St Lynn, his successor as president of SRF. Both wear crosses, emphasizing Jesus Christ as the savior of the West (... with Krishna as the savior of the East, the same messages but with different emphases). The views expressed are the personal, independent views of the author and are not intended to reflect the views of any other individual(s) or organization(s). Friends - the author is a student of the Yugas. Any profits from the various Dwapara Yuga books, media and sites (dwaparayuga.com and facebook.com/dwaparayuga) are donated to the One Laptop per Child Organization (OLPC) for the benefit of children in the developing world. Poor Richard is a pen name in homage to Ben Franklin, America's founding father, who used the same literary device. My spiritual name is Gyanananda - bliss thru divine wisdom. If you have a feedback, a suggestion, or just an opinion, please feel free to reach out. The views expressed are the *personal* views of the author and are not intended to reflect the views of any other individual(s) or organization(s). I am a firm believer in a "marketplace of ideas", recognizing the value of opinions from all perspectives, so avoid the kinds of Kali Yuga inspired "hate speech" that can be characterized as "organization or individual A is entirely evil and my preferred organization or individual B is entirely good".